When you’re pregnant much of your focus goes into planning for your birth and practical purchases for your baby. But once your baby is here the reality of how much your life has changed in that one instant can be quite overwhelming. The first few weeks with a new baby in your life are a mix of emotions, learning to feed, change, cuddle and find ways that your baby will happily sleep all at once. 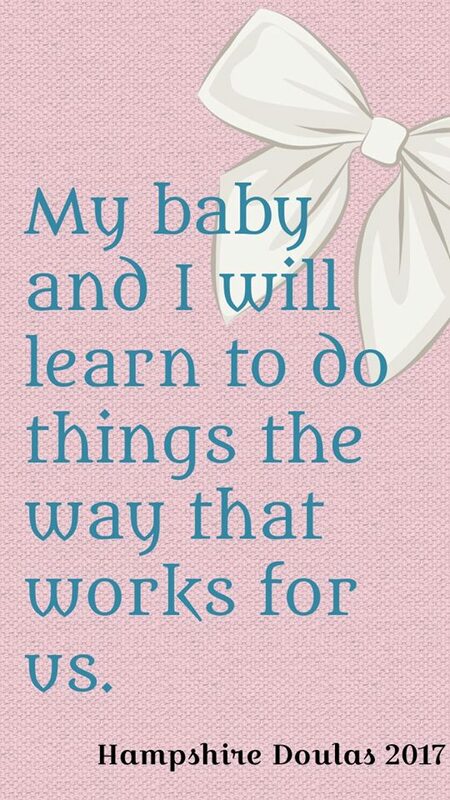 Some of the skills you used preparing for your birth can help you through this time too. Any deep breathing and relaxation exercises can help you calm down when things start to get stressful, going for a walk or dancing around your kitchen can bring some light relief and help soothe a crying baby and positive affirmations can help you to keep your focus and remind you what’s important. Here are 5 of the Hampshire doulas’ favourite positive reminders for new parents. If your baby isn’t here yet you might also find these positive affirmations for birth helpful. The days are long but the weeks are short. When the day seems to be going on forever, when it feels like you haven’t slept in as long as you can remember, when you wonder if you will ever drink a hot cup of tea again. This reminder is that in the whole length of your life with this new child these first few weeks are not really very long at all. 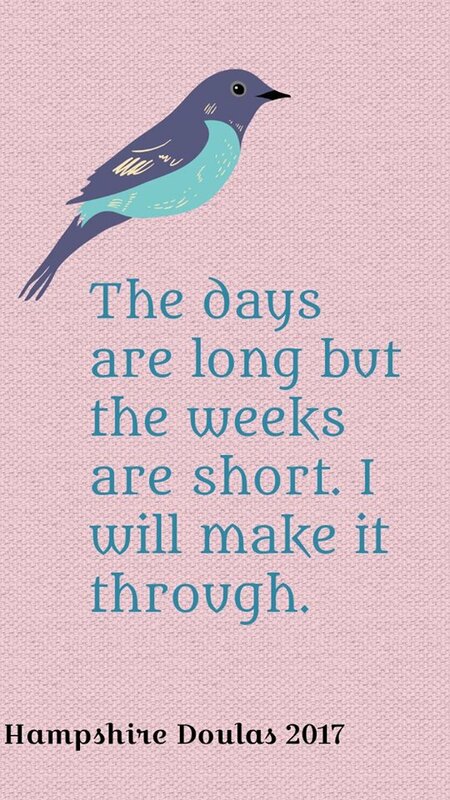 The other wonderful thing about reaching the end of each week is you can look back and remember how far you have come. 2. One of the inevitable parts of being a parent is worrying, is my child well, are they developing ‘properly’, am I doing a good job? Sometimes books about how babies grow are helpful and reassuring but sometimes, especially with the ones that claim to be able to solve all your problems and make your child a ‘perfect baby’ they can increase the stress we feel. The good news is there’s no such thing as a perfect parent and your baby just needs you to love them. The way things work for you is the right way for you. 3. It’s so very easy as our new identity as someone’s parent develops and begins to flourish to forget that we are people too and that we matter as well. 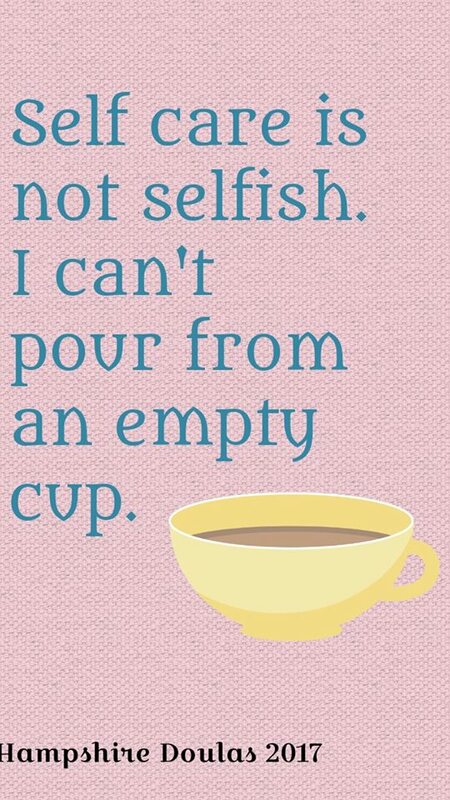 We need to look after ourselves. When there’s a new person in your life, who you are so in love with and who has so many needs it’s easy to get to the end of the day and realise you’ve not had a moment to yourself. Now that moment doesn’t need to be totally alone or something out of the ordinary but it needs to be a time when you’ve realised you need to care for yourself and you’ve done something that feeds your own soul. This can be as simple as taking a walk in the fresh air with baby in the sling, asking your mum to cuddle her new grandchild for half an hour while you have a nice long shower or just putting on your favourite music or TV program and relaxing in your chair once your baby has finally fallen asleep. 4. Sometimes we feel euphoric with a new baby and sometimes we feel just amazingly tired. It’s completely normal to have ups and downs, good days and bad days. It’s also OK to admit you don’t love every moment. It’s important to seek out your tribe at this time, to build a network of friends you can trust to be honest with, to be able to say I had an amazing day and I feel wonderful without worrying they will think you’re showing off. But, to be just as able to say “I had a terrible day, I haven’t showered I have eaten only chocolate all day and my baby has been super grumpy I’m so fed up,” without worrying they will think you’re a bad mum. To have people who will always say ‘me too’ ‘I get what you mean’. Sometimes we can know the way we feel isn’t ok with us, we can’t seem to ever feel really happy, we’re always worrying everything seems to be on top of us and we haven’t had any good days and it’s OK to admit that’s how you feel. In fact, it’s important to talk about it if you feel like that. Find someone you can trust, GP, Health Visitor, a really good friend who will help you get the help you need to stop feeling like that and go back to the usual ups as well as downs of life. 5. Whatever your first few weeks are like with your baby they are part of your story and you will make the right decisions for you and come through the other side. You won’t be exactly the same as before you had your baby, and that’s all good. Your new you and new reality may take time to get used to but know you are amazing. Learn to love the new you, you’ve got them with you for life. 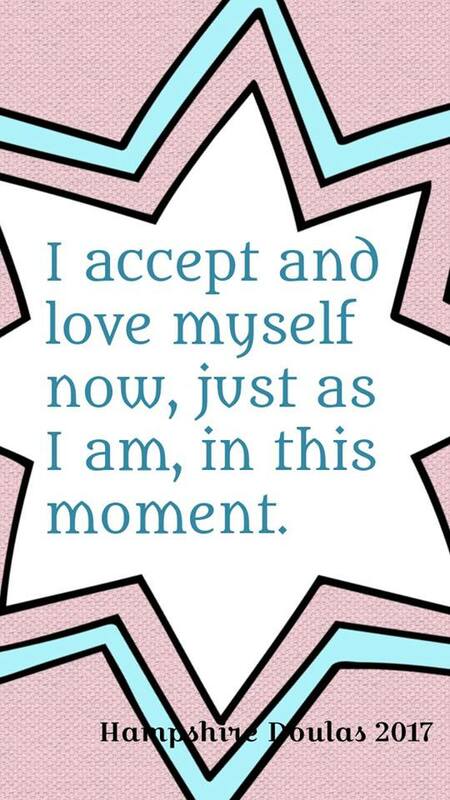 Which is a positive affirmation we can all use and remember, whatever stage of our life we’re in right now. This is part of my story. Loving yourself doesn’t mean you’ll never change or never grow it means you love yourself enough to make good choices for you and to keep on learning.